The interview in Stockholm has perhaps provided us with the most polished and proficient performance by the McCann couple to date, polished in both their appearance and almost off pat delivery of their tale of abduction. A McCann ‘outing’ would never be complete though, without a dash of damage-limitation always included for good measure, not solely to serve the purpose of diminishing their part in whatever became of Madeleine - though that too, but rather another desperate attempt, an exercise in painting a pretty picture portraying themselves as not only the injured party but of being whiter than white. Sad faced Kate -I’m damned if I smile, damned if I don’t- McCann, a keen dramatist, coupled with the discomfiting smirk of Gerry -where is the child- McCann never fail their audience, their self-centred conduct always makes for cringe worthy viewing. An interview with the McCann’s coupled without the main ingredient - the now customary sprinkle of ‘put downs’ directed at the Portuguese Police and anyone else in fact, who may disagree with their abduction theory – is something too that we have come to expect. The upside is perhaps that each time Kate McCann makes an appearance, deliberately or otherwise there are disclosures. She tells us too, that the twins are able to re-collect events prior to May 2007 which she states has “thrown her”. In what way one might wonder? Does Kate McCann hope that they may recall the night of 3rd May 2007 and be able to throw some light as to who removed Madeleine from Apt 5A? Does it worry her that they might remember something crucial, or, was she simply thwarting an unwelcome question by the interviewer when he made the point that the twins may be too young to actually remember Madeleine? No prizes for spotting the deliberate mistake... But what possible reason could Kate McCann have for stating 4th May and not 3rd? Another red herring, she is rather fond of fish! Time will no doubt tell, but one thing we can be sure of - this was not a faux pas. She does not “really know anything else since” she declares. Extraordinary that she should say this, as since the sighting by her good friend Jane Tanner there was another sighting by the Smith family, which sadly from Kate’s statement, seems to have escaped her memory. The question of the patio door being left open/closed by Kate after entering 5A on her check is as always a puzzle! In the interview with Oprah Winfrey, Kate states she looked behind her to see if she had left it open. She said she had not. In ‘Madeleine Was Here’ the McCann documentary, the ‘episode’ as to whether she closed the door behind her on entry, is not included at all in their portrayal of events. One wonders why – two different versions? Now in the interview in Sweden, it re-surfaces. Kate McCann said in this interview in Stockholm, that when the children’s bedroom door slammed shut, she checked the door behind her (patio door) to see if on entry to 5A she had left it open? She stated she had not. She, therefore based on this, knew that the bedroom door slamming shut was not caused by airflow from patio entrance. Yet, surprisingly, she did not then investigate what had caused the bedroom door to slam closed, where this gust had come from? To most, the obvious answer the bedroom window, but Kate does not check this out, she continued to close over the bedroom door in preparation of leaving 5A without investigating further... then she notices Madeleine is missing. Not dissimilar to Gerry McCann. Looking in on his children, the open bedroom door once again being the ‘alert’ that something was not right. Yet on discovering his children were asleep had not been out of bed, he too fails to investigate further, he returns to the Tapas. Quite extraordinary behaviour from both parents each stating the door caused them, if not concern, made them curious, yet each not bothering to discover why the door was open. If the child could not get past the first obstacle, the curtains, then stands to reason she would not have needed to attempt the other obstacles (the shutters). What it tells us though, is that when the McCann couple left the apartment by whichever door – the curtains framing the patio door were drawn closed, meeting in the centre. If the McCann’s left by the patio door, and depending on whether the patio door from the inside opened right to left or vice versa, did they on leaving draw back the curtains at the central point where both curtains met so as to exit, in so doing, disturbing them, then returning them to original position? Or did they slip through the curtains at whichever side the door opening would be? If they were able to do so, slip through without opening the curtains there is no reason to suggest that a child, just days shy of her 4th birthday would not be able to do likewise, that she could not slip behind curtains, and with much greater ease than her parents and their friends. Also it appears that the patio door not only had heavier style curtains but also net curtains, of a flimsier material. So, two sets of curtains for the parents, those checking to deal with? Which then begs the question, when Kate McCann entered 5A did she draw open these curtains to one side to gain entry, or did she simply flap around until she found an opening to get through? What did Matt Oldfield do on his check? Did he return curtains to original position on leaving? And Gerry McCann, how about him? He claims to have left by this route also? If Kate did not open the curtains on entry, when she then “looked behind her” to check if she had left the patio door open, her view would have been obscured. How could she have been sure it was closed without going over to the door and taking a closer look? We therefore have to assume the curtains were open at that point, whether opened by Kate on entry, or that they were never closed at any time that night. In which case, Madeleine would not have had any “problem” with curtains as suggested in their interview. Not one of them has ever mentioned curtains, having to negotiate them on entry/exiting by the patio door! In police photos the curtains are open. Would that be how they were found to be on their arrival? 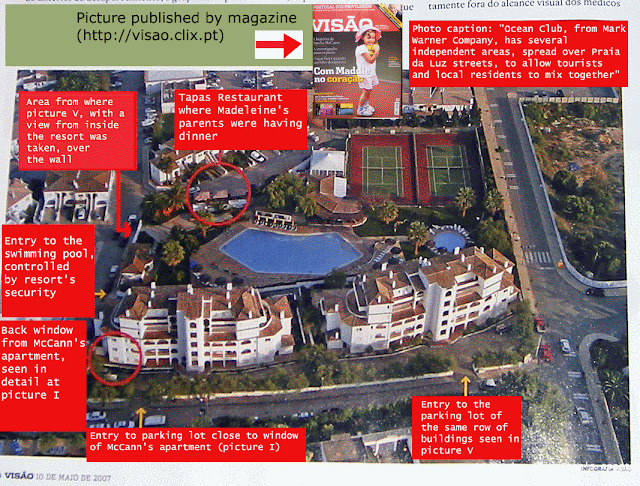 Did the McCann couple/their friends draw them open and pin them back before police arrived? Kate McCann always said, “if they had had to think about their decision to leave the children it would not have happened.” They have said many times that they, due to Madeleine telling them she was awake and crying the previous night, that they talked it over and decided to make more regular checks than on previous nights. Clearly, then if they were making more regular checks on the 3rd then they did not check as often as half hourly on the other nights. 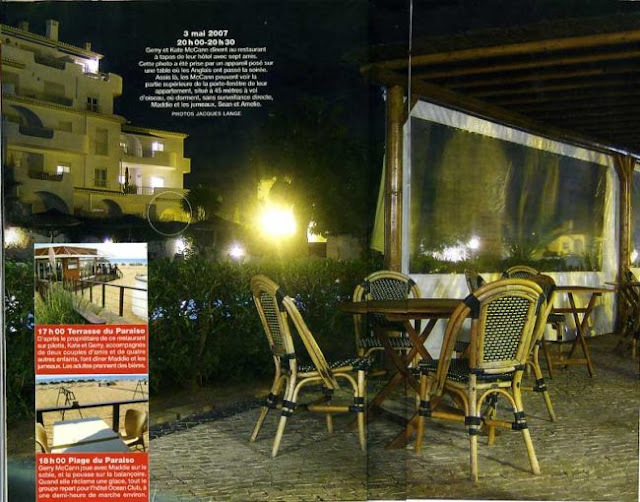 Kate said, interestingly that it felt like a really “natural” thing to do, to go eat at the tapas restaurant on the complex. Not a mention, that it felt unnatural to leave three babies under 4 years of age alone while they did so. It is the most bizarre of statements, yet no one but no one questions them on this, not in any robust way? We have Gerry declaring how overprotective Kate was with the children. This is absolutely not demonstrated by their actions on any night during that holiday- their “collective mistake.” But how could the collective mistake have been allowed to continue when on the morning of 3rd Madeleine alerted them to their mistake. There it should have ended. On the night of 3rd there should not have been a repeat of this “collective mistake.” Some may consider, accept that it was a mistake up until that point, but most definitely not thereafter can it be described as such. It then became, without question, child neglect. They knew the risks, they knew their children had been awake and crying, they knew by leaving them they were placing them in a vulnerable position, a state of fear. They made a conscious decision to do so. Gerry describes the alleged abductor as having taken a risky opportunity, Gerry and Kate McCann simply took avoidable risks with their children's lives. 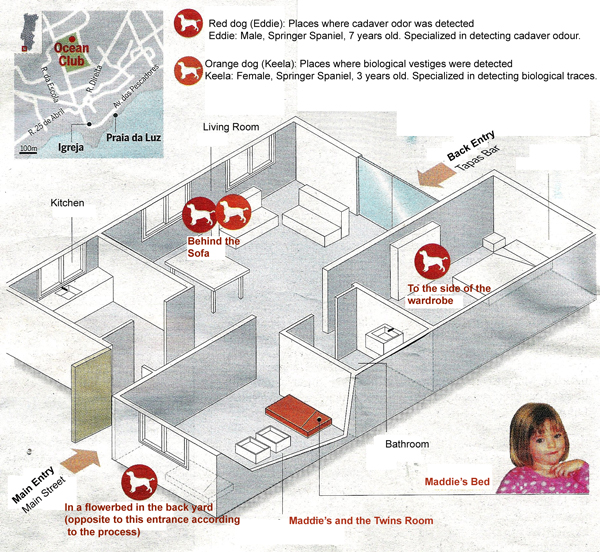 More important might be that all of the above contradicts the rogatory statement given by Fiona Payne, when she declared that Kate McCann told her she left the patio door unlocked for Madeleine to be able to exit the apartment in her parent’s absence. 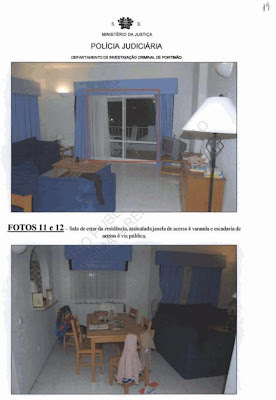 And I must point out also, in the McCann documentary, ‘Madeleine Was Here’ the film footage depicts the children’s bedroom as having net curtain, it is seen blowing in the breeze. (I do appreciate this was filmed in Rothley) Did the children’s bedroom window at 5A have netting? If so, another obstacle for any intruder - again two sets of curtains – that's troublesome! Gerry's little dig that their children will read the horrible material on the internet which is written about them. It cannot be denied there is some nasty material out there. But more than this, they should be worried that the children read the police files, watch the interviews given by their parents, the ducking and diving, the money making which could easily be described as “scams”. But who knows, before that happens perhaps the culprits, those responsible for the crimes committed against Madeleine, will be behind bars. Reply “She did, she brought it up and that she, I mean, this is awful in retrospect as well, she asked what my opinion was on, erm, tut, on whether they were okay leaving the, the doors unlocked, because she was saying ‘Is it better that if Madeleine wakes up she can get out and find us or’, erm, ‘or locking it and, you know, finding that we’re not there and the door’s locked if she woke up’, because Madeleine had woken up, what I thought was the night before. Erm, tut, and it was in that context really, just asking, you know, what I thought. So it was obviously something that was on her mind a bit, huh”. Reply “No, that was the point, I think they said they’d left it, well she’d said she’d left it unlocked”. Reply “And she felt a bit nervous about it but Gerry, Gerry had sort of said ‘Oh it will be fine’, you know. But she was obviously, because it wasn’t something she was quite easy with, that’s the way it came across, you know, but, but Gerry said, you know, ‘It’ll be fine. It’ll be fine’. Fredrik Skavlan [Host]: Kate and Gerry McCann welcome to Stockholm. Kate and Gerry: Thank you. Host: It’s been almost five years eh since, since eh Madeleine disappeared and now you Kate are reliving the whole thing by writing a book about what happened. Why are you doing that? Kate: Well I actually started to keep a diary back in May 2007 I was advised to do it actually, and at the time I felt it would be important for Madeleine really, so that when we found her we’d be able to fill in the gaps in her life, and then I also thought it would be good for Sean and Amelie as well, so that they would have an account of the truth of everything that happened. Host: If we could start by going back eh to May 3rd 2007, what’s your strongest memories of Madeleine from that day? Gerry: I think the strongest memory I have is, of really, the photograph it was the last photograph we have of her and eh ye know, we’d had a lovely holiday. Madeleine was having a great time and just after lunch we went over to the pool area and eh she was sitting there paddling in the pool and I was sitting next to her and she turned round and she’s just beaming. And then the last time I saw her which was probably minutes before she was taken when she was lying asleep. It’s terrible, I’ve said this a few times but I had one of those poignant moments as a parent where I went into the room the door was open, I just paused for a second and I looked and she was sound asleep, and I thought how beautiful she was. The twins were asleep in the... their cots and I thought how lucky we were. And within ye know, minutes that was shattered! Host: What happened is that you went to eat with the other parents that you were on vacation with? Host: This was not far from the apartment? Kate: It’s about 50 metres as the crow flies but that’s about 70 metres on foot. Host: Yes, and as you sat there in this restaurant you went back and forth on shift to check on the children is that right? And what happened when the last time you went to check? Kate: Well it was 10 o’clock when I went to check on Madeleine and em I walked into the sitting room of the apartment and I noticed that the children’s bedroom door was open further than we’d left it. We always use... close it quite far over but just enough so some light gets in and it was quite open. And it was our friend Matt who had checked on the children at half past nine when he was checking on his daughter next door, and I thought to myself well maybe, maybe Matt‘s left the door open when he checked on them. So, I walked over the bedroom door and I was about to close it to again, and as I did that, it kind of slammed shut, and I thought oh there must be a draught and I checked the door behind me and I hadn’t left that open. And then I opened the door again of the children’s bedroom just to leave it open a little bit and that’s when I really looked in. And I couldn’t quite make out Madeleine in her bed and I just looked and looked and erm it was obviously quite dark, it must be a parental thing when you don’t switch a light on in case you’re worried about waking them but then I realised she wasn’t actually there and then I thought she must have wandered through to our bedroom and maybe that would have explained why door was open. So I went into our bedroom and she wasn’t there and that was the first time really that the panic hit and I just ran back into her bedroom, and literally at that point the curtains which were closed just kind of flew open and that’s when I noticed that the window was open as far as it could go and the shutters outside had been raised all the way up. And I just knew straight away that someone had taken her. Host: So, this was your first thought? Kate: Yeah, absolutely, there’s no way a young child could have got out. Host: This decision of not eating in the apartment it has been lot of discussion about that not staying in the apartment, to go to eat with the other parents as you did every night. Host: This was really not something you thought twice about? Kate: I think if we’d had to think about it or, even say to each other ‘do you think that’s okay?’ it wouldn’t have happened. But it just felt like a really natural thing that we’ll eat at the restaurant on the complex. Gerry: I think the hardest thing with this is, ye know with hindsight we made a mistake erm it was a collective mistake but unfortunately we can’t change that, and erm whatever anyone may think about our decision making that night Madeleine’s completely innocent and you know she’s been taken and erm it’s hard for us because ye know no one could feel more guilty than we did to... to... to, think that your behaviour gave someone an opportunity, a risky opportunity , but one that they took, and ye know we persecuted ourselves for that, but you’ve got to look forward you can’t go back we can’t change that unfortunately, and erm what we’ve tried to do is, is always to look forward. Host: Were you the worrying kind of parents, I mean..? Gerry: I’ll answer that! I would say - I wasn’t but Kate was! I would have said that Kate was a bit over protective. Whereas I grew up in a big family the youngest of five and you feel, oh you know, indestructible but Kate was much as an only child maybe I don’t know, but definitely much more protective of the children than me. Host: Eh how was that experience? Gerry: We were expecting a Metropolitan type response and I remember saying to the officers “where’s the helicopters? I want helicopters with heat seeking equipment.” And ye know the officer kind of laughed at us and said “you know this isn’t you know we don’t have a Royal Navy” and this thing... and you just... and I’m sure every single parent can understand this because everyone has lost a child momentarily and the terror and how frightening it is, be it in a supermarket or a playground or a park, and you just want everything done and you want... you want the world to stop, and, and scream, and the response ye know was slow. And that’s been one of the hardest things for us, because ye know, Madeleine could have been moved very easily and the Spanish border is only about 90 minutes away and obviously you are on the Mediterranean, and one of the aspects of why we are campaigning internationally is because she could have been taken anywhere. Host: What happened was that as time went by, you didn’t really trust the Portuguese police and they didn’t trust you? Gerry: We were there for three/ three and a half months we felt we had been completely eliminated from the enquiry we’d been interviewed...the circumstances, ye know em and then ye know for whatever reason, and possibly pressure, and a desire for this case to go away, it was portrayed in media that there was very strong evidence that Madeleine was dead people have said DNA and other things, and that we were responsible for hiding her body...and.. Host: Was there not DNA in the car, in the car that you hired? Gerry: And we want to be absolutely clear about these things there are two aspects- We didn’t hire that car for 3 and half weeks until after Madeleine was taken, and the second aspect is there is no DNA match. Eh you know when you see the files there’s a mixed sample of DNA that comes from 5 people and obviously some of it matched Madeleine’s. But of course, all, of our DNA matches Madeleine’s. To be fair, ye know it was incredibly frustrating from the time we were arguido, through to the file being closed the following July but the Prosecutors final report was very clear, actually unequivocal, there was no evidence Madeleine was dead. And there was no evidence that we were involved but certain people have chosen to ignore that information. Host: Which one of these media speculations was most shocking, was most hurtful? Kate: I mean there were loads, but I guess the worst thing is if they say she is dead, and there is no evidence because if she is dead there is no search. Gerry: I think the other thing just to go back to that Frederik is that - We had an interview with the police which Kate details in her book, an unofficial interview, and basically two of the senior officers were saying to us em “Tell us what happened, we know what happened.” And I was in tears, saying “Do you have evidence that Madeleine is dead because if you do, as her parents we need to know.” And they were saying “it’s coming, it’s coming”. And that ye know, the pressure that was put on us to confess to a crime of hiding your own daughter’s body and to say that you were going to pursue us for murder. And it’s not unique to Portugal, this happens with police the world over, it’s happened to many different people it’s happened to other parents in similar situations to us. Host: How is your daily life, it’s been five years, how is your daily life affected by this...or do you have a daily life? The Process archival written by two Portuguese Public Ministry prosecutors, called by Gerry McCann mistakenly as the 'final report', actually states something different. Gerry: It’s probably important to emphasise ye know, we do spend obviously a lot of our spare time focused on it. The last year we’ve slept a lot better knowing the review is taking place. But if you had a casual observer looking at us as a family they would see a family of four. They’d see a happy family of four, and they wouldn’t really see they wouldn’t suspect that we’ve been erm ye know suffered a great trauma... em but for Kate and I... Sean and Amelie are as happy as any 7 year olds that we know and for Kate and I, we get enjoyment from life and we do, we do, do that, but until Madeleine is back with us there’s always going to be a void and there’s a limit, whereas before you could be, you could have unbridled joy, anything now, there is always a tinge its often the family things because Madeleine is not there with us. Host: How has it affected your relationship? Kate: Well we’re very lucky in that our relationship was very good very strong before this happened and I’m not sure we’d have survived if that wasn’t the case I mean I don’t think there could be anything more traumatic than what’s happened to us plus all the additional stuff on top of that. Host: You said you’ve written the book for the twins, how much do they know? Kate: Probably as much as we do to be honest now. Host: Can they really remember? Kate: Well obviously they were very young, but they have re-counted things that happened prior to May 2007, which has kind of thrown me a little bit. Obviously they have been surrounded by Madeleine ever since. There’s pictures all around the house and Madeleine’s bedroom is still there, they’ve obviously seen things on the television and they know that my job really has changed from being a doctor to looking for Madeleine. Gerry: And I think it’s important to say that they still see Madeleine as a big part of their life, and as parents that’s incredibly comforting and they’ll say things like “We’re going to go on a an aeroplane and we’re going to look for that man, and when we find him we’re going to...”and I’ll say we’ll give him to police, but they even talk about that. But I think if we don’t find Madeleine in the next...period we will face more difficult times as they get older and they are on internet and they start seeing some of the vile material which is there. Host: In your book you mention that you have been perceived as, as cold in a way? Kate: Well someone’s always got an opinion and I think we’ve learned how judgemental people can be and I mean I think its maybe part of human nature, we are all quick to judge from a position of ignorance. Host: Is there a right way of grieving a wrong way of grieving? Host: Were you advised on how to behave? Gerry: We...I mean the very initial things we weren’t, but when we did the first sort of direct appeal to the abductor, em Kate... we were... and I was told that Kate should speak as the mother, female voice and that she should not show any emotion in case that gave the abductor some sort of kick so that particular appeal, but I think as much as anything ye know Kate had probably cried 16 hours a day for 4 days, by time we did that, and we were just drained, you cannot physically cry 24 hours a day, I mean it’s impossible. Kate: The day we did the appeal to the abductor which was on the Monday and I spoke to Alan the councillor and I said, I feel really numb and I felt really bad that I felt numb I just... and he said “Kate you can’t cry for 24 hours a day, you know this is, this is natural” but..(lets out sigh) it’s hard I mean if you laugh people will say how can they laugh when their child has been abducted if you don’t laugh you’ll either get called cold or you’re on the edge of a nervous breakdown or, it’s just hard, you’ve just got to be who you are. Host: Do you have days that when you can forget, when you can sort of not think about it? Kate: No I don’t think there is any day when Madeleine is not on my mind you know she is always there but... For 18 months/2 years I never thought I’d enjoy myself again I never thought I’d allow myself to enjoy anything again, and with time you adapt and I realised that actually it is okay to do that and it is important to do that, you need to get rest you need to enjoy life, and you have to be well and happy ye know for each other, for Madeleine when she gets home, for Sean and Amelie, and thankfully ye know, we are in a position now where we get a lot of enjoyment out of things, Sean and Amelie in particular. Host: Today almost 5 years later what do you believe happened to Madeleine? Kate: Well my view hasn’t changed you know since 4th May really, and that is, that a man took Madeleine. And that man was the person who our friend Jane Tanner saw carrying a child away from the area of the apartment. And sadly I don’t really know anything else since. Host: How long can, do you think you can find the strength to continue this search? Kate: As long as it takes. I don’t think any parent would ever be able to give up on their child and even the weeks where we are absolutely shattered erm or there’s another injustice that comes your way, you get up the next morning and think ‘right let’s go again’ because Madeleine is part of our family we all need her back and she needs to be with us...just need to keep going. Gerry: I mean There are times when you just think - I cannot do this, any more, em its too much - and particularly the attention that’s comes through the media, but as Kate says that bond with us, and with Madeleine and for Sean and Amelie, and even if you wanted to I don’t think we could stop. Host: Please know that our thoughts are with you thank you so much for coming here to Stockholm and telling us, reminding us about Madeleine is still missing. Fiona quoting Kate: "Is it better that if Madeleine wakes up she can get out and find us..."
A possible impossibility (Kate said it was "impossible" elsewhere). What sane Mother would even consider her 4 year old child wandering that street looking for them at night? It's a ridiculous story and I don't believe this conversation took place as stated or at all. I'm not convinced this conversation took place either nor that Matthew Old field entered through unlocked door. I think this was said to bolster the changed story from entering front with key. I think it's possible the first statement was correct and they went in with key and only changed it to the patio door being unlocked when they realised they couldn't get away with the window break in scenario. Could somebody tell me why he can't express himself clearly here.please? Hobs? @worriedmum wrote: Could somebody tell me why he can't express himself clearly here. please? Hobs? I am always reminded of Sir Humphrey Appleby, flapping and gibbering as he tries to sort things out in his head before answering - only he manages to ! from this rise? I know the Cabinet Secretary would be. Jim Hacker : - Go on. to Cabinet ministers and junior ministers. . .